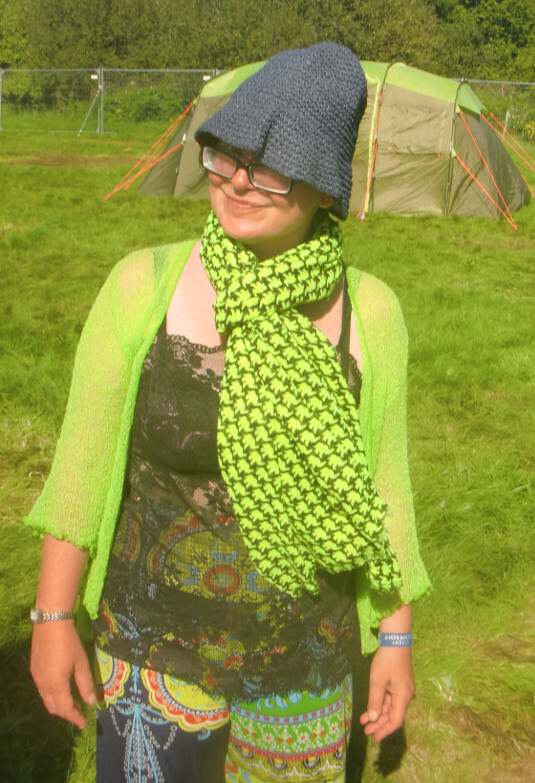 Christina (below), Des, Mark and myself attended the Green Man Festival 2018, held at Glanusk Estate, Powys, Wales. 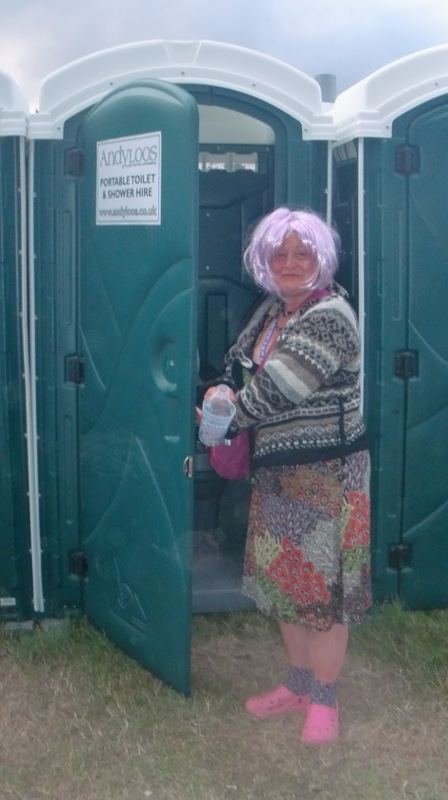 Christina, Des and myself have been to the festival every year since 2011, and since 2013, have stayed for seven days as Green Man Settlers – this was Mark’s second visit to the festival. We got to the site on Monday 13 August, and we all (well, nearly all!) erected our tents. Two of us afterwards went to the Settlers Bar to sample the Growlers bitter. Before the start of the actual festival, we enjoyed the entertainment and drink laid on for settlers as well as consuming the various sausages and other products available from the excellent and newly instigated Cashells stall which was a temporary offshoot of the shop in Crickhowell. We particularly enjoyed during the festival Public Service Broadcasting (“teach the lessons of the past through the music of the future”), Joan As Police Woman (west coast influenced, definitely), Floating Points live (psychedelic dance with live generated visuals), Baxter Dury (London tunes mixed with a bottle of red wine), John Grant (great tunes), and headlining the festival The War on Drugs (Americana sung to a Kraftwerk beat) (below). The Sunday evening concluded with traditional burning of the Green Man and associated firework display. On Monday 20 August 2018 we transferred our campsite to Park Farm Camp Site in nearby Llangattock. Des went back to London, and we walked into Crickhowell and went to the Bridge End Inn and the Britannia Inn. 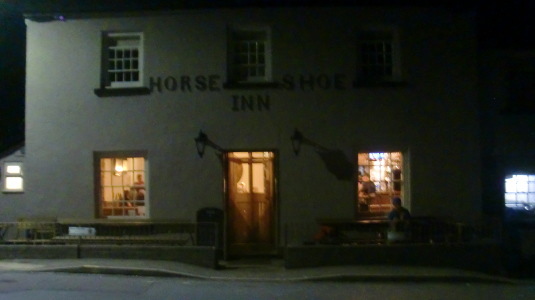 In the evening we went to the Horse Show Inn (below) and met the friendly locals. Mark returned home on Tuesday 28 August 2018, and Christina and myself continued to enjoy the local area, until returning home on the afternoon of Monday 10 September 2018. Another excellent vacation in South Wales – we’re already looking forward to a return visit in August 2019! I attended the fantastic Ealing Beer Festival on Friday 13 July 2018. I attended the seventh LPD Annual Members’ Forum on Sunday 4 February 2018. 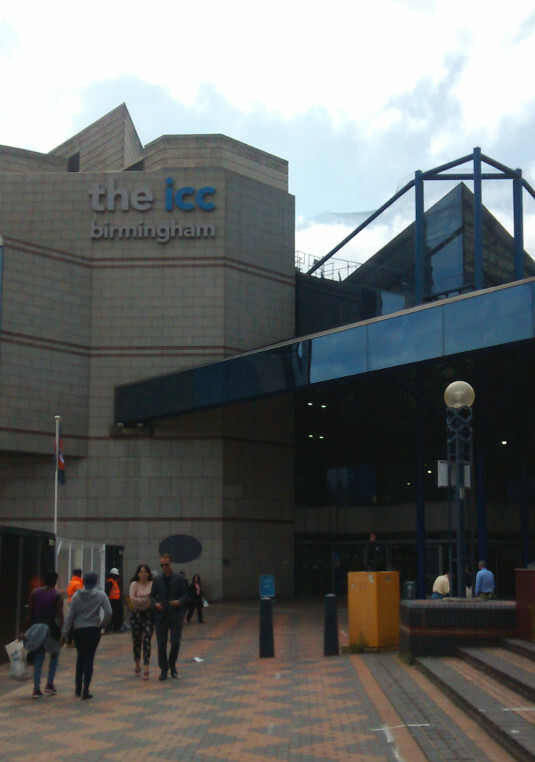 This event was followed by drinks in the Lock Tavern pub. 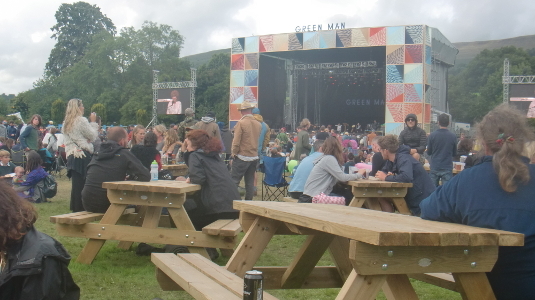 Christina, Des, Mark and myself attended the Green Man Festival 2017, held at Glanusk Estate, Powys, Wales. Christina, Des and myself have been to the festival every year since 2011, and since 2013, have stayed for seven days as Green Man Settlers – this was Mark’s first visit to the festival. We got to the site on Monday 14 August, and we all (well, nearly all!) erected our tents. Afterwards we then went to the nearby Settlers Bar to sample the various alcoholic beverages available. Before the start of the actual festival, we enjoyed the entertainment laid on for settlers, particularly Parobas in the Settlers Bar. We also visted nearby Crickhowell, making sure we went to both the Bridge End Inn and the Britannia Inn. 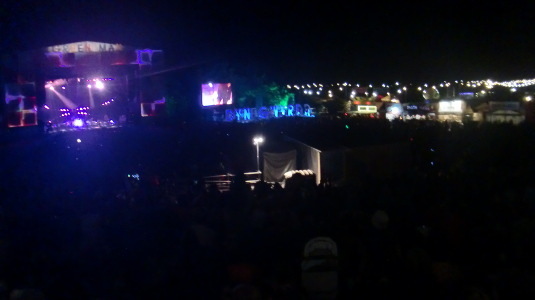 We particularly enjoyed during the festival Future Islands, Michael Kiwanuka, Shirley Collins, Tom Ravenscroft and his late night party, Saint Etienne, Julian Cope, P J Harvey along with a good dance in the Chai Wallahs. On Sunday evening the festival concluded with traditional burning of the Green Man and associated firework display. On the Monday Des returned to London (via Bristol! ), whilst the rest of us stayed at the Park Farm Camp Site – the weather was so fantastic we stayed camping for a further two weeks! Another fantastic holiday in South Wales – we’re already looking forward to Green Man 2018! 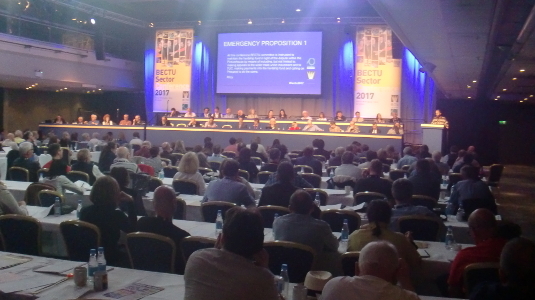 I attended the BECTU Sector Conference on Sunday 7 May 2017 at the Hilton Metropole Hotel in Brighton. 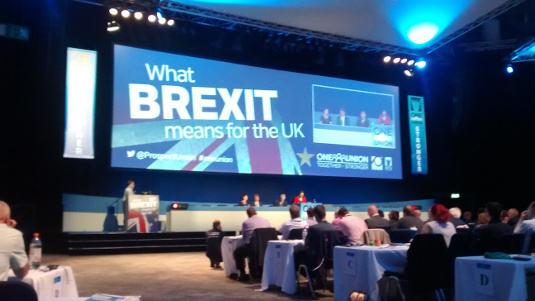 This interesting conference, also attended for the first time by Communications and Digital Division as a result of the recent merger with Prospect, is the first of a series of biennial gatherings. 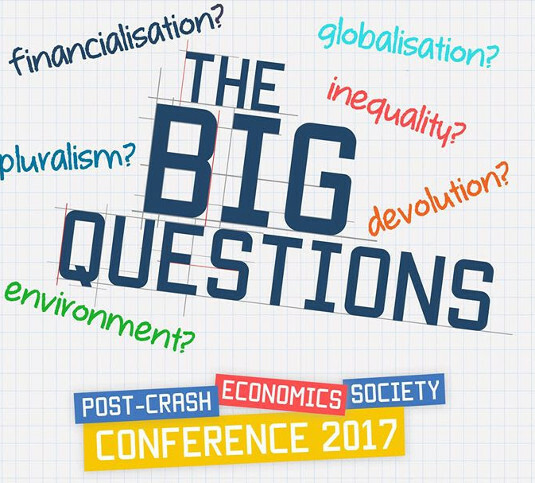 Many thanks to all the participants and organisers for contributing to an involving conference.